We are a family owned business that has been designing and manufacturing the highest quality staircases crafted around you since 1977. Using only the finest materials, from sustainable sources each and every staircase we deliver is created by skilled designers and experienced craftsmen, combining traditional skills with state of the art technology and software. Why don't you come and see for yourself at our showroom, give us a call on 01952 608853 or drop us an email. We create the finest quality staircases. We offer the best value for money. We provide a free design service and can deliver nationwide in as little as 10 days. Our bespoke staircases are crafted around you. As one of the UK's Leading Staircase Manufacturers we can offer a solution if you are looking for a new Timber Staircase. Premium Staircases - Contemporary and Traditional Styles Crafted to the Highest Standards. 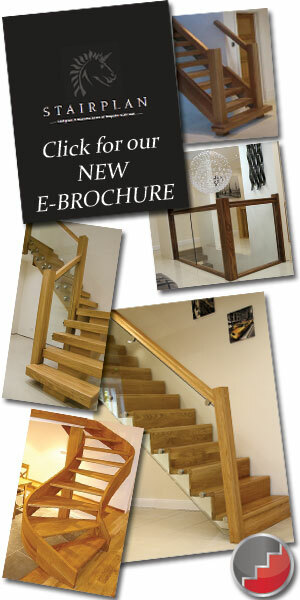 Ordering your staircase is easy just call we will give you the options. Express Order Service need your stairs quickly ? Stairplan manufacture purpose made timber staircases, We use the latest software and cnc technology to produce the stairs to the highes standards whilst keep our products affordable and on budget, We offer a wide range of stair parts ie:- handrails, spindles, ballusters, newel posts and other banister fittings from a wide range of suppliers all at trade prices.Curved staircases , flatpack kits purpose made stairs, wreath handrail, made to measure. we are staircase specialists, space saver loft staircases we also supply Balustrading components.
" Use our Online Store - Tradestairs.com for Stair balustrading parts and a popular selection of Staircases."